Please note: some mapping applications/GPS systems misinterpret our street address. For best results, use the GPS address or the directions and map below. From the north—From I-695 (Baltimore Beltway), take exit to I-83 south, exit 7, Druid Park Lake Drive. 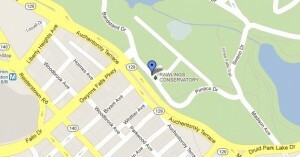 Follow Druid Park Lake Drive until it merges into McCulloh Street and look for signs for Baltimore Zoo. Turn right into Druid Hill Park at Gwynns Falls Parkway (5th traffic light). Turn right immediately after entering the Park. The Conservatory is on the left. From the south—From I-295 (Baltimore-Washington Parkway), drive directly into downtown Baltimore. Turn right onto Pratt Street and then left onto Gay Street. Stay to your left on Gay Street and take left lane exit onto I-83N. Take exit #7 and follow Druid Park Lake Drive until it merges into McCulloh Street. Turn right into Druid Hill Park from Gwynns Falls Parkway (5th traffic light). Turn right immediately after entering the Park. The Conservatory is on the left. Nearest Metro/Subway stop—Mondawmin Mall, 10-minute walk. Nearest Bus stops — 22, 51, 52, 53, 97, stops at Mondawmin Mall, 10-minute walk. 1, 5, 7, 21, 54, stops at Gwynns Falls and Reisterstown, 10 minute walk. Visit the Maryland Transit Administration page. View a Google transit map. Ample free parking is available on the street around the Conservatory and throughout Druid Hill Park. There is no charge but a $5 per person donation is encouraged. We gladly accept cash, checks, and credit. 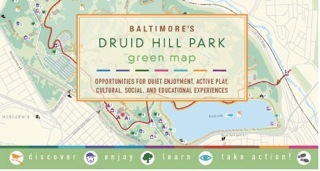 Baltimore Green Map’s attractive Druid Hill Park Green Map highlights the Conservatory and other major features of the park. It also offers a brief park history and 50+ listings of historical, natural, cultural, recreational, and other park elements. The paper map is available at the Conservatory, Baltimore Bicycle Works, and Falls Road Running Store or by contacting info@baltogreenmap.org. It is viewable here in pdf format. You may also explore the park via the interactive Open Green Map®. There you can leave comments and tell others about what impact the park has had on you. View HP Rawlings Conservatory & Botanic Gardens in a larger Google map. The Conservatory greenhouses are wheelchair accessible. Handicap parking is located on the street in front of the Conservatory. We offer docent-led group tours, private tours, and field trips that must be scheduled in advance. We offer free drop-in tours to the general public on the 5th Sunday of the month, as part of our Plants and People program. We offer a cell phone self-guided tour, which is available at any time during the hours we are open to the public. Free, excluding what your carrier charges for minutes.